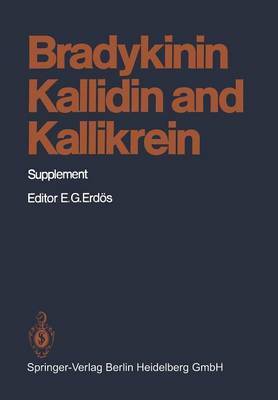 Volume XXV of the Handbook of Experimental Pharmacology series entitled "Bradykinin, Kallidin, and Kallikrein" was published in 1970. My aim in editing this volume of the series is not to replace, but to update the 1970 edition. During the decade preceding the publication of Vol. XXV, the existence of kinins and kallikreins gained acceptance, the protein components of the system were purified and characterized and the peptides were synthesized. Even after these accomplish- ments, interest in the subject has not abated, but has increased substantially. We have learned a great deal about the role that components of the kallikrein-kinin system play in other systems and about the immensely complex and intricate inter- actions in blood. Directly or indirectly, kallikrein and kinins affect the coagulation of blood, the activation of complement, and the generation of angiotensin. Kinins release or modulate the actions of other agents, including prostaglandins, histamine, and catecholamines. Inhibitors of kallikrein or kininase II are employed, for example, in extracorporeal circulation or in hypertension. Kallikrein, kinins, and kininases, present in urine, were described first in 1925 and 1954, but have been ignored for decades. These substances are now studied extensively because of their possible role in blood pressure regulation. The evidence that kinins have a metabolic function is also increasing. The abundance of active components of the system in genital organs suggests a role in the fertilization process. The book is organized into chapters which bear upon these issues.